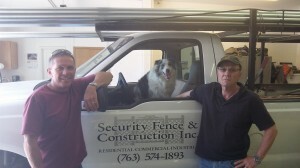 For over 30 years, Security Fence & Construction (owner Jim Olzeske) has been providing customers with quality products and unprecedented customer service. Our fencing solutions are highly sought out by many in the Minneapolis area because we are family owned, have a full-time staff with over 100 years of combined experience, and we are always ready for any job of any size. We provide a wide range of fencing options, including specialty options when the job that you need done falls outside of typical fencing installation. We understand that our customers have visions and we want to ensure that those visions are brought to life. This is why we have become a premier fencing company in Minnesota. This is why when a customer needs a custom job for their residential or commercial property, they call us. The Best Materials – We work with only the best materials that are installed by the most experienced installers. Do the Job Right – We make sure the job is done right by working carefully, although we work quickly. We recheck our work to make sure it is truly complete. The job is not done until you’re satisfied. An Accurate Estimate – You will be given an estimate and a proposal that is accurate so you know what the cost is going to be for the materials and the installation. High Quality – You can always expect the highest quality service and the best materials. In fact, you can expect quality from the moment you contact us until the moment the job is officially finished. We have a very long list of satisfied customers and we take pride in that act. We experience a lot of repeat business and referrals all of the time. This tells us that we are definitely satisfying our customers every time. This satisfaction stems from each employee’s respect for the customer, their knowledge, their positive attitude, and a desire to build long-lasting relationships. Whether you are someone who wishes to take a job on yourself or you want to take full advantage of our services, we are here for you. Our customers are important to us and so is the community. We enjoy being a part of the many communities in and around the Twin Cities area and playing an important role in these communities. We are proud of the fact that we have maintained a deep commitment to the residents and businesses throughout Minnesota. If you are considering fencing or you are ready to get the job done as soon as possible, call us at (612) 788-4729 and let our professional staff and experience do a great job for you. We ensure you have answers to your questions, that you are treated the way you should be treated, that you receive a response in a timely manner, and that you are always satisfied. We work with only the best materials that are installed by the most experienced installers. We make sure that the job is done right by working carefully, although we work quickly. We recheck our work to make sure it is truly complete. The job is not done until you're satisfied. You will be given an estimate and a proposal that is accurate so you will know what the cost is going to be for the materials and the installation. You can always expect the highest quality service and the best materials. In fact, you can expect quality from the moment you contact us until the moment the job is officially finished.